BLOOKUNITY. Are you ready for an intense 2000 word guide to define YOUR book blogger trademark? It's super detailed, but don't worry — it's divided into 5 simple steps and summarised into two sentences. Stay until the end for that summary! In this post, I'll be analysing the 5 essential components of a book blogger's trademark. This guide can help you carve out your own individual niche and make your mark in the blookunity! Background image from Creative Market. Pin this, won't you? Last week on Twitter, I told about 70 bloggers what I thought their trademarks were, and there were a few themes that kept popping up. Why is having a blogger trademark important? There are many, many, many book bloggers out there. Having a trademark makes it easier for everyone to remember you in the blookunity, and if you're THE person with that trademark, people will automatically think of you when they come across it in real life! Having a trademark is like having the same profile picture across all your social media. It makes people remember (and like!) you more because you're different. 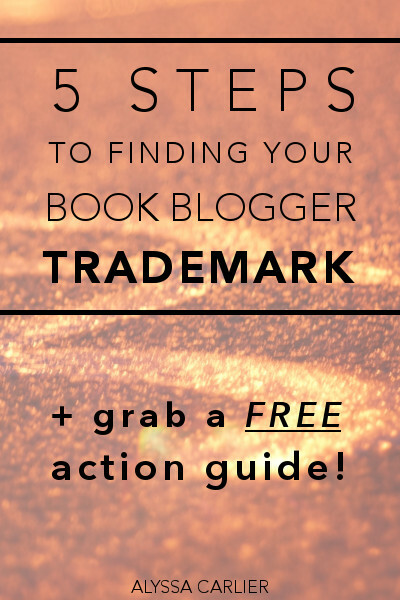 If you're not sure what your trademark is, and you want to have a unique image in the blookunity, read through these five steps and create your own book blogger trademark so everyone will associate you with a few specific things! Looking to promote your blog to book lovers? My giveaways are promoted to 1000+ subscribers and have gotten up to 18K impressions on Twitter. Email me to sponsor one now! So without further ado, the 5 essential components of a book blogger's trademark! 1. What are your major post types? Many people have recurring blog series. For example, every month, I talk about Chinese culture and that's one of my more popular posts. I don't post book reviews, but I write lots of bookish discussions. I also post writing snippets every now and then. You don't necessarily need to only write this type of post, or change all your blog posts — just take a look if there are any major trends! If you're having trouble finding what types of post you write most, try to figure out which post types receive the most comments/pageviews/shares. BUT don't go for something that's not that unique. Like book reviews or blog tours or Top Ten Tuesday posts ... let's be honest, 80% of the blookunity do those, and they're not as memorable. Find what makes you different. You can emphasise your major post type by making a "top posts" widget in your sidebar or footer or adding it to your navigation bar! That way, people who land on your blog will immediate see these posts and associate you with them. 2. What are your recurring themes? All book bloggers will of course talk about books. So to set yourself apart, you need to talk about specific books in a specific way. I explain Chinese customs every month, and I write Chinese-inspired books, and basically I carry a sign saying "China" through the Internet. A lot of people told me they associated me with Chinese culture. What's more, I sometimes get random DMs or messages asking me about Chinese culture. (Which I 200% welcome!) Now I'm sure I'm not the only person familiar with China in the blookunity, but I make a point of emphasising it. Get known for talking about a specific subject matter, and you'll be the go-to person for that. a) What is your favourite genre? There are some bloggers that read everything and anything, of course. But some people review mostly contemporary, mostly historical fiction, mostly romance, mostly dystopian. And most likely you also have a favourite genre — this is your ready-made trademark, y'all. Then you need to narrow it down. My favourite genre is fantasy, in case you didn't know. But I'm not so much a fan of urban fantasy as something that is 80% speculative. This is easier for me because I write novels and categorise them in my head, but just scan your shelf and see if any genres pop out at you! I'm also a huge fan of fairytales and mythology and legends, which is why another of my trademarks is myths and retellings. 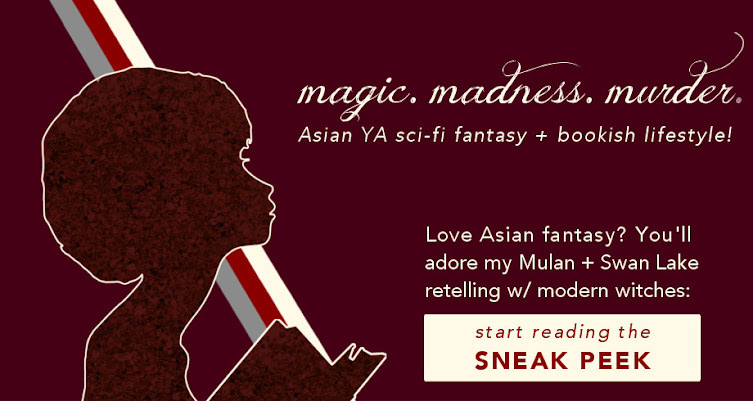 Many of my manuscripts are retellings, especially YA fantasy retellings. And yeah, these trademarks might overlap! Which makes for a more coherent trademark. In a moment, we'll try to put all these together to make ONE trademark sentence to define you, so make sure these fit together. b) Who are your favourite authors? Yeah, yeah, I can hear you complain about finding this. Not to worry, I have an infographic for you to find your fav author. There's no need to have a single obvious one. My favourite author is Victoria Schwab, author of A Darker Shade of Magic amongst others, and in case you didn't know there's an #ADSOMreadalong going on at the moment and you should most certainly join in the fun on Twitter! Wait, see what I did there? I just advocated an author — who writes many books in my favourite genre! Having a few obvious favourite authors helps define your genre in a much more specific way. And remember, it's not just knowing in your head who is your favourite author — show it to the world! Throw their books at people! Take bookstagrams of their books! Advocate the author. It's good karma, but by recommending books to others, the blookunity will remember your fandoms. You'll be THE [insert author] fan. c) What bookish causes do you support? In case you didn't know, I love diverse representation. I basically never. shut. up about it. My tagline and bios include my advocacy for diverse representation. I discuss diversity like ALWAYS. There are so many causes you can take up in the blookunity. You can support indie or debut authors. You can support #readwomen or #ownvoices. You can focus on reviewing LGBT+ or mental illness books. You can support local bookstores and libraries. 3. What is your writing style or voice? I try to keep my blog posts snarky but stay away from too many emojis, although I do use caps occasionally. I'm much more informal on Twitter and go loose with caps and emojis and *flailing*. But my novelling style tends towards the lyrical side. Emojis — this works even better if you overuse one specific emoji! Get this 30-step guide to stand out in the blookunity! 4. What is your aesthetic? The colours I use on the blog are red and white and black, with a few shades in between. This background is actually a pale shade of pinkish yellow, I think. I definitely go for bold and badass more than sweet and sassy, because that's who I choose to be online. Let's revise some of those art lessons I've forgotten! Do you use warm or cool colours? Grayscale or highly saturated? Pastel or dark? Create a colour palette and play around with it! I use a lot of Times New Roman, so I suppose that's why I'm "Gothic"? For my blog graphics, I use Avenir Next, which is a simple, more minimalistic font. It doesn't contribute towards my aesthetic, but it doesn't contradict either. Thick cursive fonts, thin dainty fonts, carefree handwriting fonts ... there are so many options here! There are of course other aesthetic things such as gifs, or how your profile picture looks. And if you're on Instagram, perhaps you have a specific aesthetic there — apply it to your blog design, your Twitter headers, everything. This can also become much more concrete if there's a specific object that can convey the aesthetic. Like a certain shade of lipstick, or a logo! (I actually am thinking I might need to switch up my flower logo sometime. Huh.) Add these items to your profile pictures or social media headers. Tada, aesthetic established! If you have no idea what your aesthetic is? Get inspired with Nova @ Out of Time's aesthetic guessing game! See if you can guess mine, it shouldn't be difficult. She'll do a how-to post for aesthetics soon, so stay tuned for that. 5. What is your random favourite thing? This is not mandatory, and in fact is probably detached from the rest of your trademark. But a random favourite thing adds personality. You're not just a book blogger, you are also a human. (I hope! )Having a favourite non-bookish thing reminds the blookunity of that. So don't say "Oh I love books" or "I fangirl a lot". Sure, that's part of your trademark as well, but a random trademark is there to add something else. Mine is of course takeout — it's in the blog title, I often send people virtual takeout, I use puns like Dim Summary, and I call my readers a takeout army. Bonus points if you include it in your profile photo — this is easily done if it's a tea/coffee mug, or a camera, or cake, some such! Plus here's your two-sentence summary of this blog post! Your book blogger trademark in a sentence: I am a [genre] book blogger who writes [writing style] [major post type] about [recurring theme], with [an aesthetic]. Also, I love [random thing]. I didn't follow the template exactly here, but I get the same message across by showing, not telling! This is even better and can take your trademark to the next level. Want to develop your trademark? Grab your 30-step action guide right now! The thing is — a single component cannot define your trademark. A list of a few things? That's what you should aim for — a coherent group of issues/ideas/concepts that you'd totally dig.